Above: Garbage piling up outside, mouse droppings on the floor, and backed up sinks. Photos courtesy of Ken Roth. 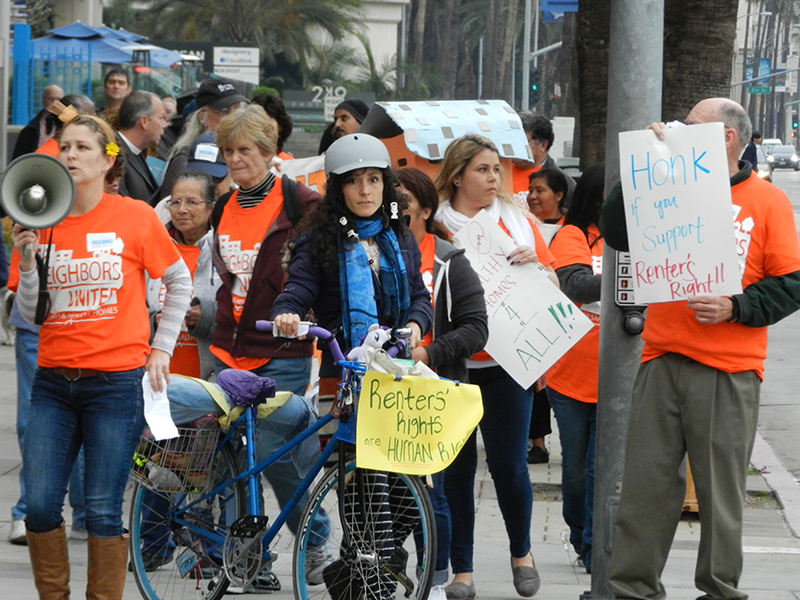 Below: Demonstrators march to Long Beach City Council chambers in support of renters’ rights. Photos by Jason Ruiz. For nearly six weeks after moving into his First District apartment late last year, Ken Roth was without properly working plumbing in his home. There was standing water in the sinks and bathtubs, a broken dishwasher and every time he used the garbage disposal, his downstairs neighbors’ light fixtures filled with water. Roth, who just completed his doctorate at UCLA, thought his housing issues were over after leaving his last residence in Belmont Heights behind. There, it wasn’t the rodent infestation that forced him out as much as it was the sky-rocketing rent. But even finding “fresh kills” in the traps placed around his unit paled in comparison to the time he had to file a restraining order against his landlord, who struck him in the head with a 250-pound gate after he resisted the landlord’s attempts to convince Roth to move out of his Second District apartment so the landlord’s girlfriend could move in. Roth has lived in in a multitude of cities across the country from the Bay Area to Denver, but says he’s never seen a rental landscape tilted so much in the landlord’s favor. Having lived in three different districts in Long Beach, he also knows that those inequalities aren’t unique to any particular pockets of the city. It’s very clear, says Roth, that there is an issue with how problem-landlords are dealt with in Long Beach, but what isn’t clear is why there hasn’t been much of a push to fix it. For the better part of three years, Kerry Gallagher has dedicated her work to helping those who, like Roth, due to the limitations of the city’s ability to combat bad landlords, have few options when faced with the prospect of eviction or rising rents after they report habitability issues to code enforcement. Since she joined Housing Long Beach in 2012, Gallagher has spearheaded the initiative to adopt a Rent Escrow Account Program (REAP), like the one in Los Angeles, here in Long Beach. The program, which was originally supposed to be included in the City’s recently-adopted Housing Element, was omitted to allow for further review by city staff. 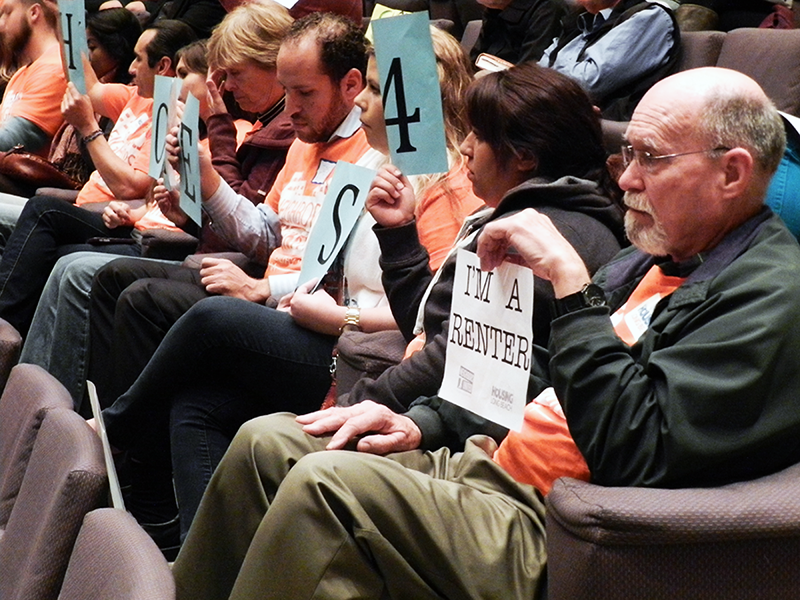 As their recommendations make their way to the council floor for an anticipated vote May 5, it’s become apparent that the last three years of work by the advocacy group—the group who recently led a rally to City Hall in January to address the council and has shared the plight of renters during public comment almost weekly—has done little to soften the city’s reluctance to incorporate tougher restrictions on these so-called slum lords. In a staff memorandum obtained by the Post, Director of Development Services Amy Bodek outlined several reasons why a renters protection program is not feasible in Long Beach, citing legal, logistical and financial burdens as reasons why amendments to the current proactive inspection process the city currently has in place, and education on how to use that system, are more viable options for Long Beach. Comparing it to the Los Angeles version of REAP—a program adopted by the city over 30 years ago, which allows renters whose units have been cited for habitability issues to pay their rent, or a reduced version of it into an escrow account that can only be accessed by the landlord after repairs are made—she called it “an intensive administrative program” that would require the formation of its own department. She also estimated the program would require a first-year operating budget of nearly $2.3 million. The LA REAP program currently operates on a budget of around $1.8 million. The staff report stated that according to LA REAP staff members, the average unit stays in REAP for 17 months. Due to the economy of scale, the report said that a REAP program could not subsist in Long Beach on the $50 monthly fee paid by landlords that the LA program does; instead, the city would require $196 per unit per month to recover the full cost of the program and pay the 13 full-time staff members the report says would be required to operate it. Her close work with the LA branch has Gallagher perplexed as to why a city like Long Beach, which has a little over 10 percent of the number of rental properties that Los Angeles does, would need a larger operating budget. She also questioned certain parts of the budget, most notably the projected $95,815 budgeted for a clerk to file notices with the County Recorder’s Office, calling it overstated for something that in reality would amount to sending in a form letter. Moreover, a corresponding memo from City Attorney Charles Parkin detailed why the city’s lack of an existing rent control program would make it illegal for the city to establish HLB’s proposed rent escrow program, stating that it could potentially open the city up to litigation. In the memo to the Department of Development Services dated February 17, 2015, Parkin honed in on the city’s lack of a rent control mechanism to enforce a REAP program similar to Los Angeles. He stated that the REAP program in Los Angeles was created as an extension of that city’s Rent Stabilization Ordinance and because officers in Long Beach would lack the jurisdiction to withhold, collect or alter rents from tenants to landlords, trying to implement said program could make the city vulnerable to legal challenges. Deputy City Attorney Kendra Carney echoed those sentiments in a phone interview this week, saying that after months of meetings with staff from LA’s REAP program their office arrived at this conclusion. However, in a letter opposing the city attorney’s office’s stance on the matter, the Legal Aid Foundation of Los Angeles, which has advocated side-by-side with Gallagher’s group for a REAP program in Long Beach, stated that the assertion that rent control is needed to enforce REAP is completely false. It listed Sacramento, Baltimore and Elk Grove, CA as cities that have similar rent escrow programs but no rent control ordinances. Gallagher said that when her staff initially met with the city attorney’s office late last year, Parkin’s initial reaction wasn’t to question the legality of the REAP program, but instead he referred to it as a “political question” that would be up to the council to decide. She said that the letter directly contravenes what he expressed in that meeting, that the program was legally sound, adding that the fact that no case law is attached to his memo is telling. Third District Councilwoman Suzie Price, a prosecutor in Orange County, said that it is the council’s position to defer all legal matters to Parkin’s office, as it is his job to provide the council with legal direction, even if there is an attorney on the council. She said that HLB has made some great points and she’s hopeful that the city can incorporate some of their concerns into the existing structure without adopting the full program. However, Price did say that cost, whether it be a few million or a few hundred thousand dollars, is something that needs to be scrutinized with every vote given the fiscal crisis looming in the city’s near future. For Price, the merit of the REAP program is not in question. Stating that the city “literally cannot afford to spend any more money,” Price said the focus needs to shift to what needs to be cut from, not added to, the budget. Earlier this year Melissa Martinez, a resident of Price’s district, spoke on behalf of HLB and their efforts to bring the program to Long Beach. After hearing Martinez tearfully share her plight with the council, Price ascended into the public seating area to speak with Martinez, arranging for code enforcement to go to her home, where the owner was cited for repairs. Martinez returned to the council chambers late last month to share her experience. In an email last week, Deputy Director of Development Services Angela Reynolds, reaffirmed the city staff’s findings, and said that the proposed amendment to codify the city’s already existing proactive inspection program is a better and legal option for the city. Reynolds also said it’s not within the city’s scope to work out eviction issues between tenants and landlords. Gallagher said that when her group initially met with city staff to discuss the inclusion of a REAP program in the adopted housing element they were promised that the city’s program, which has been in existence since 1966 but has yet to be codified, would not be pitched as a replacement for REAP. In the recommendations, staff has suggested that the program be codified and be renamed the Rental Housing Inspection Program (RHIP) and be used in conjunction with a program run through the State Franchise Tax Board that would serve about four cases per year and cost less than $1,000 annually. The city estimates that just over 76,000 rental units would fall under the purview of RHIP—the Housing Element states there were over 90,000 multi-family homes in the city as of 2011, but RHIP only applies to those with four or more units—and of those, only 558 would have habitability issues. The report said that the figure represents .007 percent of the units inspected, making it unnecessary for an expensive new program like REAP. The city currently uses a system of escalating fines to help bring landlords into compliance, and boasts a 90 percent compliance rate within 120 days of issues being reported. However, the housing element also showed that of its stated goal of an average of 5,500 multi-family housing inspections annually, the city only conducted 2,652. The similarity in the acronyms for RHIP and REAP is no accident, according to Gallagher, and something that she views as a direct attempt to confuse those reading the ordinance. Additionally, she said the proposed $75,000 in annual outreach and education is somewhat hollow, since the city has shown it can’t protect tenants from landlord retaliation once they start the code enforcement process. Disbelief is something that Roth is accustomed to in his dealings with the city’s code enforcement process and the legal proceedings they led to when his landlords took action against him. He said that in the two lawsuits he’s filed against property owners in Long Beach his case was moved out of the main courtroom and into a private one, where a single judge, the landlord and himself litigated with no witnesses. Inside this “star chamber,” Roth said he was told by both judges that Long Beach is the “wild west” in terms of rental property and “anything goes.” He dropped both lawsuits.